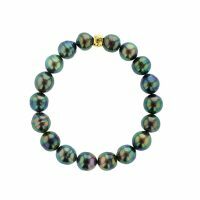 Our Signature Collection features this vibrant pearl bracelet composed of circled pearls of 8mm or 9mm, mounted on a stretch elastic for ease and comfort. 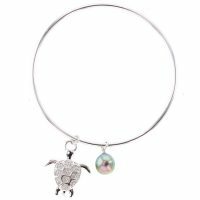 The Turtle Charm bangle features a sterling silver turtle bezeled with white topaz and a beautiful Tahitian pearl. The purchase of this bangle contributes to our Giving Back program, where Hinerava dedicates funds to Tetiaroa Society in the preservation of the marine environment. With every bangle purchased, a turtle is saved. 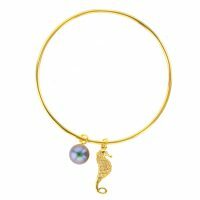 The Seahorse Charm Bangle features a seahorse charm bezeled with white topaz and a beautiful Tahitian pearl, set in 925 vermeil ( 6.5 cm diameter). The purchase of this bangle contributes to our Giving Back program, where Hinerava dedicates funds to Tetiaroa Society in the preservation of the marine environment. With every bangle purchased, a turtle is saved. 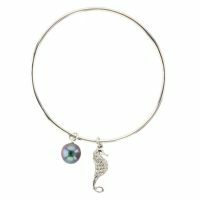 The Seahorse Charm Bangle features a Seahorse bezeled in white topaz adorned with a beautiful Tahitian pearl, set in sterling silver ( 6.5 cm diameter). 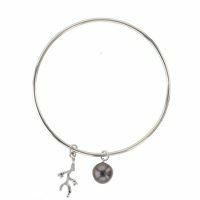 The purchase of this bangle contributes to our Giving Back program, where Hinerava dedicates funds to Tetiaroa Society in the preservation of the marine environment. With every bangle purchased, a turtle is saved. The Vermeil Coral & Topaz Charm Bangle features a beautiful Tahitian pearl and a coral charm bezeled with white topaz, set in 925 vermeil. The purchase of this bangle contributes to our Giving Back program, where Hinerava dedicates funds to Tetiaroa Society in the preservation of the marine environment. With every bangle purchased, a turtle is saved. 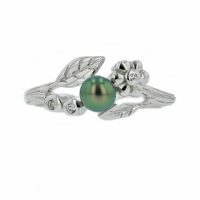 The Silver Coral & Topaz Charm Bangle features a beautiful Tahitian pearl and a coral charm bezeled with white topaz, set in sterling silver. The purchase of this bangle contributes to our Giving Back program, where Hinerava dedicates funds to Tetiaroa Society in the preservation of the marine environment. With every bangle purchased, a turtle is saved. 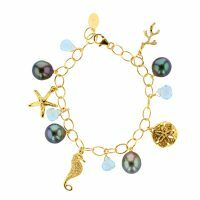 Tetiaroa Pearl Charm Bracelet features sea-life charms bezeled with white topaz and four beautiful Tahitian pearls, set in vermeil. With every bracelet purchased, a turtle is saved. The purchase of this bracelet contributes to our Giving Back program, where Hinerava dedicates funds to Tetiaroa Society in the preservation of the marine environment. 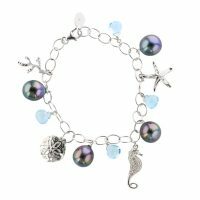 Tetiaroa Pearl Charm Bracelet features sea-life charms bezeled with white topaz and four beautiful Tahitian pearls, set in sterling silver. With every bracelet purchased, a turtle is saved. The purchase of this bracelet contributes to our Giving Back program, where Hinerava dedicates funds to Tetiaroa Society in the preservation of the marine environment. Hinerava's Elements Collection features a bracelet composed of sparkling cubic zirconia charms and Tahitian pearls, set in 18K gold over sterling silver. Hinerava's Elements Collection features a bracelet composed of sparkling cubic zirconia charms and Tahitian pearls, set in sterling silver. 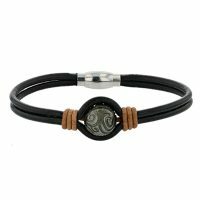 Our Elements Collection features an elegant keshi bracelet composed of rounded and oval Tahitian keshis of 5 to 7 mm, mounted on stretch elastic for ease and comfort. Length: 18 cm. Hinerava’s Element Collection features a multi band keshi bangle, linking 4 open branches finished with 8 exquisite keshi pearls, set in silver. Hinerava’s Elements Collection features a ring inspired by coral branches. 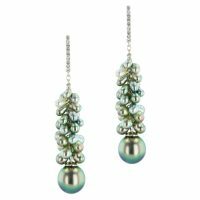 The branch is enhanced by glittering white topaz gems while a glowing Tahitian pearl rests at its center. The ring is made of sterling silver and coated with rhodium (tarnish resistant). Hinerava’s Elements Collection features a cuff inspired by coral branches. 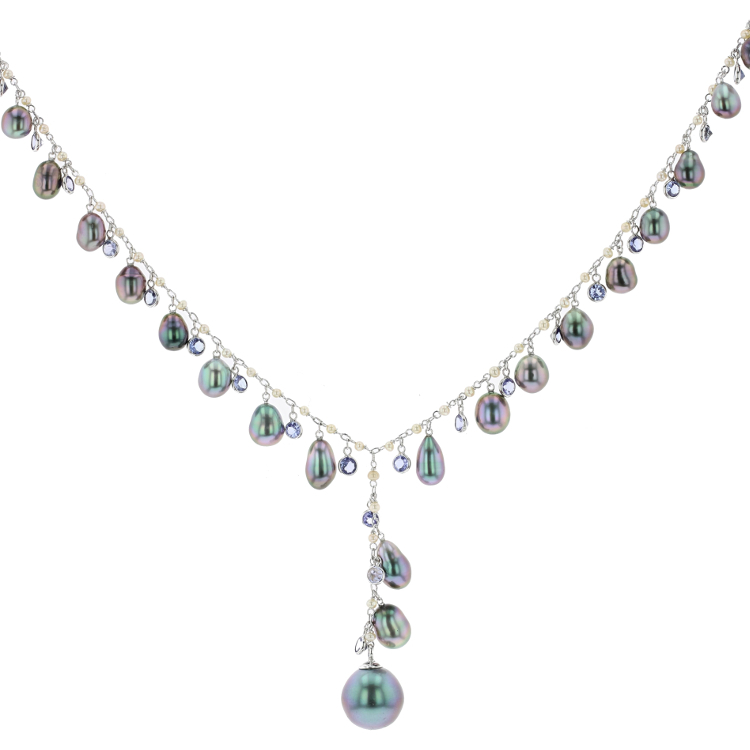 Each branch is enhanced by glitering white topaz gems while three glowing Tahitian pearls adorn the final piece. The cuff is made of sterling silver, coated with rhodium (tarnish resistant). Hinerava’s Elements Collection features a necklace inspired by coral branches. 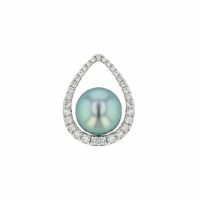 Each brand is enhanced by glittering white topaz gems while a glowing Tahitian pearl rests at the center of the piece. The necklace is made of sterling silver and coated with rhodium (tarnish resistant). The chain is adjustable between 16-18”. Hinerava’s Element Collection features a charming keshi ring designed with a flower and white topaz bezel, set in silver. Hinerava’s Element Collection features a charming keshi ring designed with a flower and white topaz bezel, set in Vermeil. 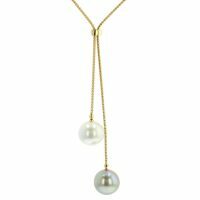 Hinerava’s Poésie Collection presents an exquisite Gemstone lariat set in 18K yellow gold with eighteen beautiful blue Tahitian Pearls. Gemstones include bl;ue and white Topaz. Length: 29cm. One of a kind. Hinerava’s Poésie Collection presents an exquisite 1,18 carat of blue topaz gemstone lariat set in 18K white gold with 26 beautiful rare and exquisite blue Tahitian keshis. Lenght: 26 cm. 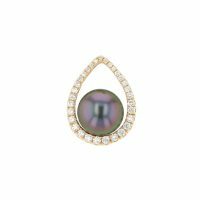 Hinerava's Signature Collection features a white teardrop pendant, 0.33 carats, set in 18K gold with an exceptional 10mm Tahitian pearl. 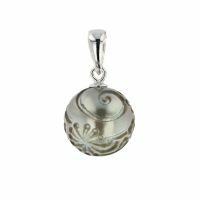 The pendant is available in yellow or white gold. 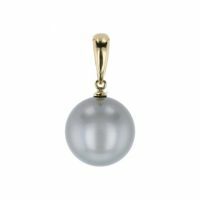 Hinerava's Signature Collection features a white teardop pendant, 0.33 carats, set in 18K gold with an exceptional 10mm Tahitian pearl. The pendant is available in yellow or white gold. Hinerava’s Poésie Collection presents an exquisite 4,25 carat tanzanite gemstone lariat set in 18K white gold with 26 beautiful lavender Tahitian keshis. Lenght: 26 cm. One of a kind. 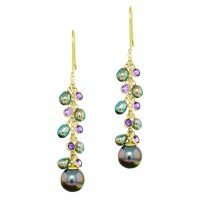 Hinerava's Poésie Collection features a romantically breathtaking 18k yellow gold lariat, composed of multi-colored sapphire briolettes - 62 carats, exquisite pastel keshis, and a peacock Tahitian pearl. This necklace is one of a kind. 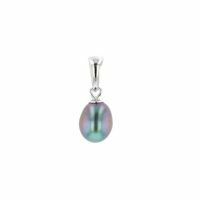 Hinerava’s Signature pearl diamond enhancer pendant features a vibrant 11 mm pearl set in 18K white gold, bezeled with white diamonds, 0.037 carat. 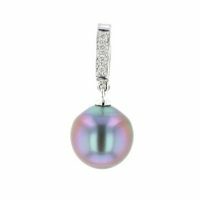 Hinerava’s Signature pearl diamond enhancer pendant features a vibrant 11 mm pearl set in 18K yellow gold, bezeled with white diamonds, 0.037 carat. 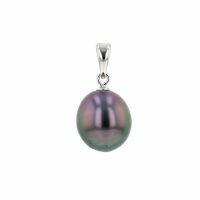 Hinerava’s Signature Collection features a pearl clip pendant, composed of a single 11mm Tahitian pearl, set in 18K white gold. 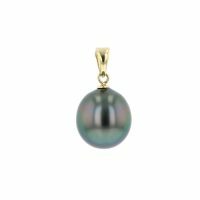 Hinerava’s Signature Collection features a pearl clip pendant, composed of a single 11mm Tahitian pearl, set in 18K yellow gold. 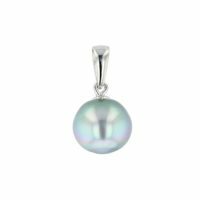 Hinerava’s Signature pearl pendant features a 9 mm pearl set in 18K white gold. Hinerava’s Signature pearl pendant features a 9 mm pearl set in 18K yellow gold. 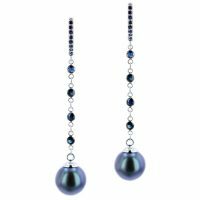 His Hinerava Collection features a trendy masculine piece composed of robust black silicone and a carved pearl available in 12 to 16 mm. Each pearl is hand carved and unique. His Hinerava carved pearl pendant features a pearl set in sterling silver, available in 9, 10 and 11 mm. 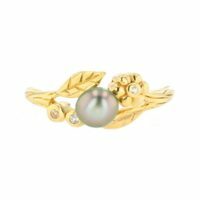 Each pearl is hand carved and unique. His Hinerava Collection features a trendy masculine bracelet composed of robust black and brown leather and a 12mm hand carved Tahitian pearl. Length: 20 cm or 21 cm. His Hinerava Collection features a trendy masculine bracelet composed of robust black leather and a 12mm hand carved Tahitian pearl. Length: 20 cm or 21 cm. Hinerava’s Element Collection features a 5 to 7 mm keshi set in silver. 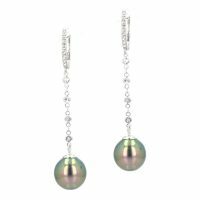 Hinerava’s Element Collection features a 9mm Tahitian pearl set in silver. 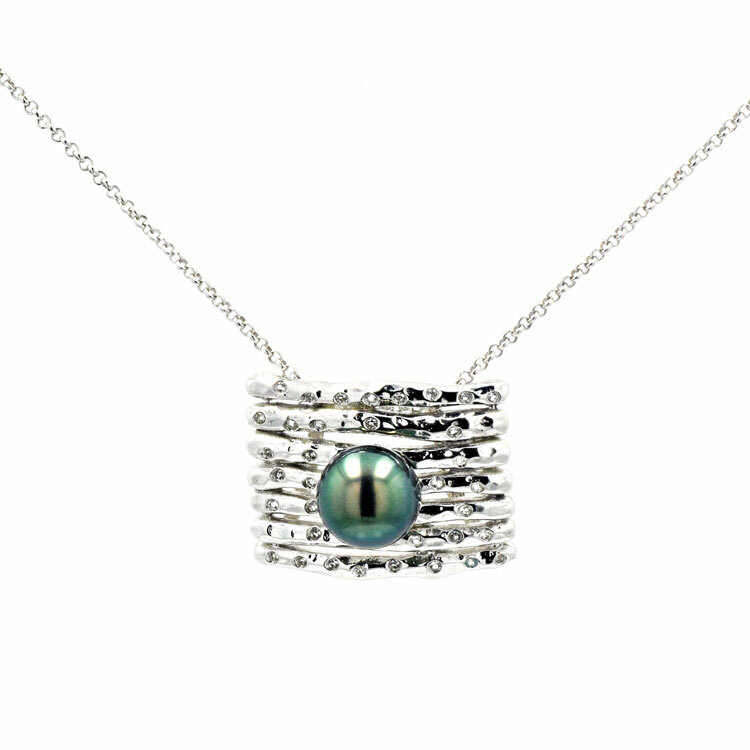 Hinerava’s Signature Collection features a Tahitian pearl necklace, set in 18K white gold. The pearl slides freely along the chain. Length : 43cm. 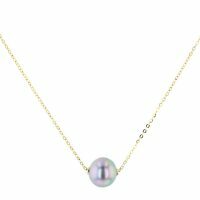 Hinerava’s Signature Collection features a Tahitian pearl necklace, set in 18K yellow gold. The pearl slides freely along the chain. Length : 43cm.